It takes a special kind of person to make it in real estate. The nature of this self-reliant business requires a leap of faith - faith in your ability to sell yourself as much as your ability to sell properties. For many, this means giving up a steady job with guaranteed pay, fuelled by the belief that you can achieve great results for yourself and your family. Our role? 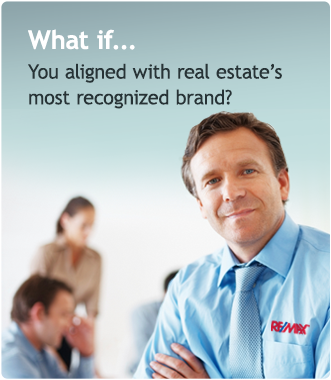 RE/MAX is here to provide you with the leading-edge tools to have a competitive advantage against the completion. You instantly get the credibility of a global brand standing behind you, cutting edge technology, and leads sent to you at no-fee so you can be a top performing real estate agents in your market. Aiding your success is the driving force behind everything we do and provide for our agents.